One of the things about hiking through the forest is you tend to spend a disproportionate amount of time looking at the ground. Walking along a well-groomed trail, through a meadow, or down the road, you’re able to keep your eyes up and take in your surroundings, or watch the birds or butterflies or other organisms that are generally found above the ground. In the forest, though, your eyes are busy scanning the ground for rocks, roots or logs that you’re liable to trip on. Unsurprisingly, one’s observations tend to have a natural bias to organisms and features close to the ground. Since such a large proportion of them grow from the ground or fallen vegetation, fungus figure prominently in such observations. I saw quite a number of neat fungi while we were out yesterday, or at least what I thought was a large number given the time of year. There are some types of fungi that are found year round, mostly bracket fungi, and those ones I’d expect to encounter, but there were many fleshy ones that surprised me, as well. The guides never mention the time of year these things are found, or how late into the fall they’ll persist, and I’d just sort of figured they’d all have faded by now. 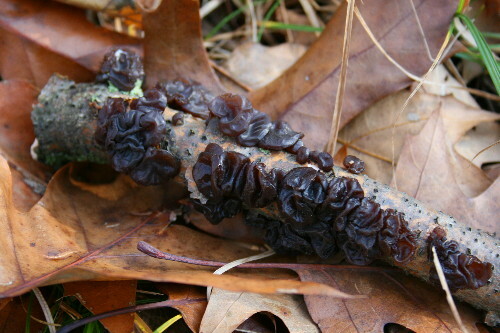 I believe this one is a type of jelly fungi called Black Witch’s Butter, Exidia glandulosa. It’s a fairly common species, usually found on the dead twigs and branches of hardwoods. I’m used to seeing fungi mostly on logs or snags, so almost missed this one, growing on the end of a broken branch half-hidden among the leaves. Jelly fungi are a neat group that don’t have the typical fungi shape, instead forming gelatinous masses that shrivel and grow according to the available moisture. We’ve had a stretch of wet weather, so these ones were filled out. 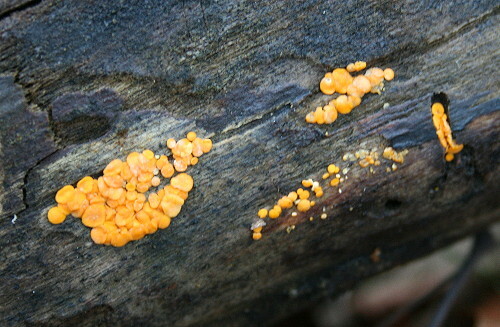 These are a common and widespread species with the delightful name of Lemon Drops, Bisporella citrina. It’s in the superficially similar but unrelated group Sac Fungi. Unlike the jelly fungi, which are basically just blobs, sac fungi do actually have stems, but in the case of this species they’re short and well-hidden. 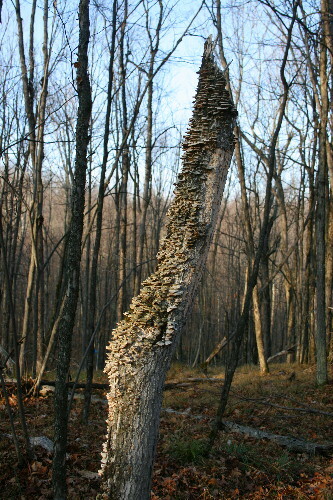 It’s found on dead logs where the outer bark has been shed (which has the fancy name of decorticated, I learned), and often occurs in huge numbers, up to hundreds of individual fruitbodies in a cluster. This group was relatively small by comparison. This was a cool one. At first I thought it was another jelly fungi, or some other sort of fungi. It took a bit of searching around on the internet, since I didn’t locate it in my mushroom guide, but I eventually found it while searching images of Copper Penny. It turned out not to be a fungus at all, but rather a lichen (I suppose technically a lichen is a symbiotic relationship between a fungus and an algae, so it is still part fungus, but not wholly so). 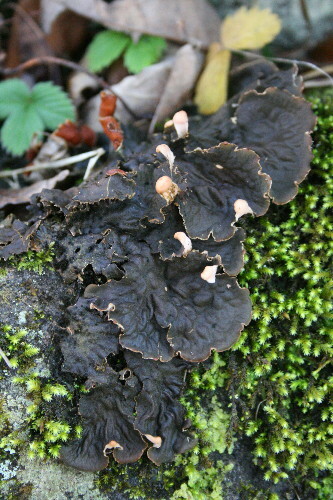 I believe it is Peltigera hymenina. I couldn’t see a common name for it, but a related species, P. canina, is called Dog Lichen, or sometimes Dog-tooth Lichen, for the resemblance of the spore-producing projections to dogs’ teeth. The species belong to a group sometimes called the Felt Lichen, for their flat, soft appearance. This is another type of lichen, and one that kept catching my eye throughout the hike, once I’d stopped and peered close enough to notice it. 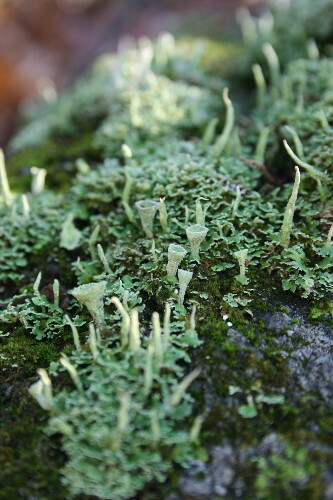 It’s a Pixie Cup lichen, a member of the genus Cladonia, although I’m not sure exactly which species. I tend to think of lichens as mostly those flat leafy formations seen underneath the cups in the photo, so I wasn’t sure whether the cups and “clubs” were part of the same lichen, a different species, or even perhaps a fungus. Turns out there’s a whole variety of lichens, not just the leafy sort, in all sorts of shapes, from flat, to cup, to coral-like. This one was just small, perhaps a centimeter tall at most, less than half an inch. Speaking of looking closely at things, part of the reason I was paying closer attention to surfaces was because of a recent post by Wandering Weeta, and specifically one photo where she shows some fungal growths on the stem of a fallen leaf. It amazed me that she even noticed those, and it made me pause to wonder what I may be missing. The Cladonia are among my favourite lichens, but all of them are fascinating. The look-alikes (like those Lemon Drops you have, and Yellow Witches Butter, for example) drive me nuts. Are they a jelly, or an earth tongue, a slime or a crust fungus? Or an immature yellow coral? I wear out my field guide just leafing back and forth from one possible to the other. I’ve always liked the British Soldier Lichen, another Cladonia species. They do make a nice counterpoint to their more flatfooted cousins.